Home » Basketball » College basketball game predictions: Who ya got in Duke-UVa rematch? The first meeting between Duke and Virginia this season, won by the Blue Devils, 72-70, in Durham, North Carolina, on Jan. 19, was a thriller. Now comes the return engagement in Charlottesville, and ESPN.com’s experts have their opinions on how that might play out. Predictions for nine of the other top games on the weekend college basketball schedule are here for your perusal as well, if you’re into that kind of thing, which you ought to be! It’s Duke/Virginia, Take 2 (Saturday, 6 p.m. ET, ESPN). Who ya got? Jeff Borzello, college basketball Insider: I thought Virginia would win the first matchup, and I was obviously wrong about that one. But I’m going with the Cavaliers again. I just feel like they match up well in terms of what Duke wants to do, which is play in transition and then get downhill in the half court. Virginia limits its turnovers and keeps drivers out of the lane. Assuming Ty Jerome is healthy, I think Virginia gets the win. Myron Medcalf, senior college basketball writer: Entering the season, I think most would have projected a Duke-Virginia split with each team winning their home game, and like Jeff, I think that still stands. Yes, a shorthanded Duke (Tre Jones didn’t play) beat Virginia in the first matchup, but it was a two-point game and Virginia shot just 18 percent from the 3-point line, an odd result for a Cavaliers team that has made nearly 40 percent of its shots from beyond the arc this season. I think Virginia wins another tight game in the rematch, but scrap all of this if Jerome is hurt. John Gasaway, college basketball writer: I’ll take Duke, even if Jerome does hobble dramatically onto the court for the opening tip. (We really need to get these two teams together sometime when we’re not diverted into injury talk. Maybe it’ll happen at the Final Four.) 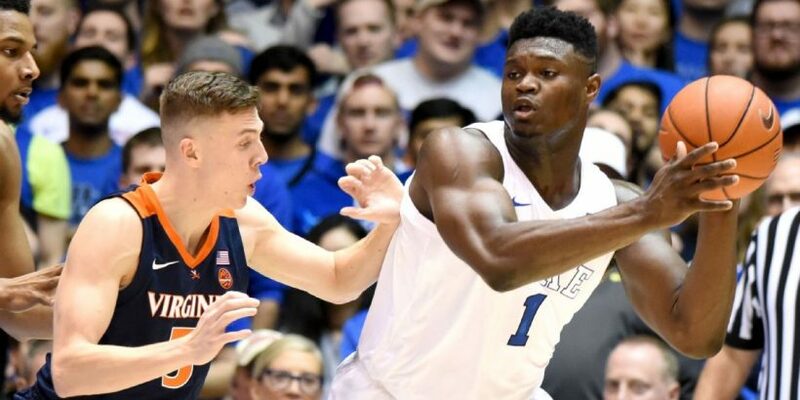 My hoops spidey sense keeps going back to what we saw in the first game: Virginia occasionally looked stymied on offense by the Blue Devils’ switching. Conversely, RJ Barrett was 10-of-13 on his 2s and put up 30 points. Blue Devils in a close one. Jordan Schultz, Insider/analyst: Give me the young Dukies once again! While both teams rank in the top five of KenPom’s offensive and defensive efficiency, this pick is in part because Jerome’s injury casts a serious spell on the Hoos’ offense. It’s not as if UVa suddenly can’t make shots — it went 6-for-17 (35 percent) from 3 without him in a home win over Miami — but Virginia still fell victim to a less efficient offense. In fact, its 56 points scored was the second-lowest total of the season. Even if Jerome plays, I like the Blue Devils for the same reasons I liked them the first time: Their rare combination of blue-chip talent and speed will prove to be the difference in Charlottesville. Expect Zion Williamson — the likely Wooden Award winner — to firmly put his stamp on this game with a 25-point double-double. Meanwhile, the Big East has become a two-team race and will pivot on Saturday’s Villanova/Marquette contest in Milwaukee. The Golden Eagles have been tough at Fiserv Forum, but after falling to St. John’s on Tuesday, could you see them beating Nova? Medcalf: I could see it since Marquette has made 40.5 percent of its 3-pointers in Big East play, the Golden Eagles have Markus Howard and they’ve already defeated comparable, if not superior, teams: Kansas State, Wisconsin and Louisville. But having the juice to win a game like this is a lot different than actually executing and getting the victory. The latter is a difficult ask because Villanova is playing the best basketball in the league right now, their best players (Eric Paschall, Phil Booth) avoid foul trouble while creating 40 minutes of matchup problems for opponents and their head coach has a couple of national titles. Borzello: I think Marquette bounces back and gets a huge win over Villanova. It’s true the Wildcats are playing much better of late, but the winning streak has sort of papered over the cracks of their defense, which is giving up more than one point per possession in Big East play. St. John’s has forced Howard into subpar games with length and athleticism; Villanova can’t really match that on the perimeter. I think Howard gets hot and Marquette gets a win. Gasaway: The thing people miss about Marquette because of the Markus Howard Experience is that this might be the best defense in the Big East. That being said, the Golden Eagles’ numbers for chasing conference opponents off the 3-point line are great in part because they haven’t had to play Villanova yet. This is going to come down to the Villanova offense against the Marquette D, and I feel a patented Nova 3-point eruption coming after that subpar shooting game against Creighton. I’ll take Jay Wright’s guys. Schultz: Yes, Marquette bounces back with a key home victory over the fighting Jay Wrights, who have quietly notched 11 straight wins. Markus Howard — whom I slotted on my midseason first-team All-American squad — is a walking bucket and the most explosive scorer in the country (he already has had a 53-point game). The fact is Villanova simply does not have its typical assortment of top-flight guards or rim protectors to coerce Howard into an off day. This is the main reason why the Wildcats are ranked outside the top 80 in defensive efficiency, per KenPom, and outside the top 200 in blocked shots. This Big East affair will be tight in Milwaukee, but Howard will prove to be the difference. Borzello: The easy way out would be to pick one of the teams in “Others receiving votes.” The Washingtons, the Auburns, the Baylors. But I’ll go a step further. I think St. John’s will be an annoying team to play, and if Shamorie Ponds gets hot, the Red Storm can make a run. I tend to get infatuated with teams that have guys who can go get a bucket late in a game, and the Red Storm might have the best one in the country in Ponds. He can carry them. Gasaway: By the way, all those low seeds then promptly lose in the national semifinal. Well, except for 2014 (UConn). Anyway, on that hopeful note, I’ll take Jeff’s easy way out (he’s trolling me) and toss a bouquet at Baylor. Pollsters and bracketologists can’t get around the Bears’ early-season losses to Texas Southern and Stephen F. Austin, and that’s fair. But, somehow, this same group that lost to the Tigers and Lumberjacks has in fact been the best per-possession team in Big 12 play. Schultz: I would like to put Buffalo here, but the Bulls are still a top-25 team. So, how about Murray State? Admittedly, this is not the most balanced roster in America, but in case you haven’t heard, Ja Morant is pretty darn good. The best point guard in America is tops in the nation with an incredible 10.3 APG to complement his robust scoring (24.1 PPG). This is a bit of a risky choice because Belmont — which already beat the Racers on the road — is also very good, and the Ohio Valley Conference is probably a one-bid league. Selfishly, we all deserve to see a little more Morant after he torched both Alabama and Auburn (31.5 PPG, 8.5 RPG, 6 APG) in near upsets. Why can’t the potential top-three pick have a great run in March? Can Auburn’s experience provide challenge for Duke’s freshmen? How does Duke get even better?